Milwaukee has a long tradition of parades, starting with the Saint Patrick’s Day Parade, which first occurred before Wisconsin was a state in March 1843. This parade, honoring Milwaukee’s Catholic and Irish heritage, was conceived and led by Father Martin Kundig, the leader of the Catholic Church in Milwaukee. The current iteration of the holiday parade is sponsored by the Shamrock Club of Wisconsin, which started its version in 1966. Parades in Milwaukee celebrate the city’s history in addition to the holidays. The “Industrial Parade” commemorated the state’s semi-centennial in June 1898. The Industrial Parade highlighted the changes in “methods and environments” of daily and industrial life in Milwaukee. The three-mile-long procession had 300 decorated floats from private and public organizations. When the city held its month long centennial celebration, dubbed “Centurama,” in 1946, among the planned events was the “panorama of nationalities” honoring Milwaukee’s diverse ethnic history. The July 14th parade lasted three and a half hours and included 115 floats, seventy six balloons (including at least some from the Macy’s Thanksgiving Day Parade), local veterans, bands, and beauty queens. The Journal Sentinel reported that, despite a summer drizzle, approximately 150,000 to 250,000 people watched the Centurama parade, making it one of the city’s largest. The Milwaukee Holiday parade, which ran for 91 years until 2017, traced its roots to the parades sponsored by the Gimbels and Shuster’s department stores. Although Gimbels held a Christmas parade for several years, the best-known holiday parades were sponsored by Shuster’s, starting in 1927. 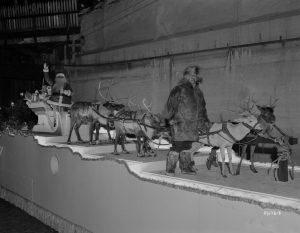 The first version of the Schuster’s Christmas parade featured Santa Claus and his reindeer and introduced Me-Tik, the Eskimo reindeer handler, and Billie the Brownie, both of whom became holiday advertising mainstays. When Gimbels acquired Schuster’s in 1962, the Schuster’s parade was cancelled so the consolidated company could focus on supporting the Downtown Associations’ annual parade. 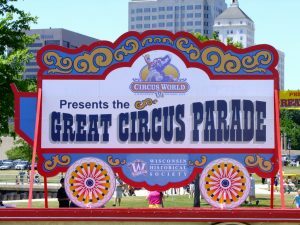 One of Milwaukee’s favorite parades was the Great Circus Parade, also known as “the Grand Daddy of Parades.” This parade was an annual tradition starting in 1963, when Schlitz Brewing sponsored the parade as a fundraiser for the Circus World Museum in Baraboo, Wisconsin. Although it was cancelled in 1968 due to the city’s racial and social unrest, the parade continued until 1973, when the Schlitz dropped its sponsorship. The museum continued holding the parade sporadically until 2009. In addition to these long running parades, Milwaukee also hosts annual Veterans Day parades, which started in 1963. The parade features floats and marching bands honoring veterans and the military. In 2016, the parade concluded at the Milwaukee County War Memorial to honor those who died in service and to commemorate World War I’s centennial. The annual Labor Day parade opens Laborfest, an event honoring Milwaukee’s labor and craft groups, the working and middle classes, and Milwaukee’s labor history. Many local municipalities sponsor their own Fourth of July parades every year, while many of Milwaukee’s summer festivals feature parades. The South Shore Frolics parade, which is considered the longest in Milwaukee County at over two miles, was held in conjunction with the South Shore Frolics summer events. 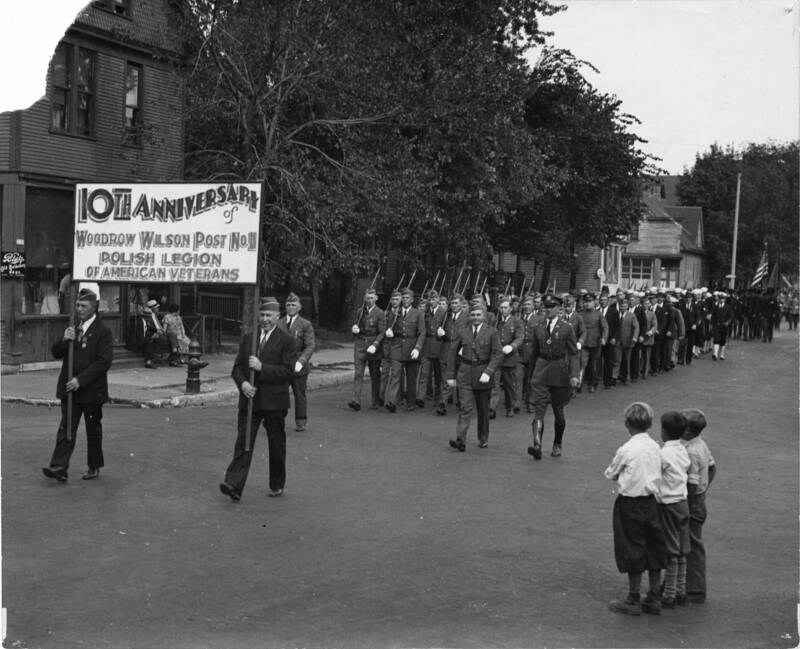 The parade, long considered the highlight of the South Shore Frolic events after its addition in the 1950s, lasted until organizers were unable to arrange funding in 2014. ^ Chris Foran, “Milwaukee’s 1st St. Patrick’s Day Parade Had Tangled Motives,” Milwaukee Journal Sentinel, March 10, 2016, last accessed September 28, 2017. ^ “The Industrial Parade,” Milwaukee Daily Sentinel, June 21, 1898, 8, Nineteenth Century U.S. Newspapers; “Milwaukee Carnival Industrial Parade a Good Thing,” Milwaukee Daily Sentinel, March 17, 1898, Nineteenth Century U.S. Newspapers. ^ “Parade of Industries,” Milwaukee Daily Sentinel, June 30, 1898, p. 3, Nineteenth Century U.S. Newspapers. ^ John Gurda, “The Milwaukee Centurama of 1946,” Wisconsin Magazine of History 90, no 1 (2006): 50-51. ^ “Centurama: A Look Back at Milwaukee’s 100th Birthday Bash,” last accessed September 28, 2017.Chris Foran, “Milwaukee’s Lakefront Hosted a Different Kind of Big Gig—in 1946,” Milwaukee Journal Sentinel, July 5, 2016, last accessed September 28, 2017. ^ Matt Doyle, “Hundreds Brave the Snow for the Milwaukee Holiday Parade,” CBS 58: WDJT Milwaukee, November 21, 2015, last accessed September 28, 2017; Lainey Seyler, “Due to Lack of Financial Support, 2017 Was the Last Milwaukee Holiday Parade,” Milwaukee Journal Sentinel, accessed November 1, 2018. ^ Paul H. Geenen, Schuster’s and Gimbels: Milwaukee’s Beloved Department Stores (Milwaukee: Milwaukee County Historical Society, 2012); Chris Foran, “Schuster’s Brings Parade to Town—in 1950,” Milwaukee Journal Sentinel, November 17, 2015. ^ Dennis Sorensen, “Milwaukee Event ‘Grand Daddy’ of Parades,” The Fort Scott Tribune, June 10, 1970. ^ John Gurda, The Making of Milwaukee (Milwaukee, WI: Milwaukee County Historical Society, 2006), 357. ^ Gurda, The Making of Milwaukee, 273. ^ Martin Hintz, Forgotten Tales of Wisconsin (Charleston, SC: The History Press, 2010). ^ Derica Williams, “‘Feels Wonderful’: 53rd Annual Veterans Day Parade Honors Those Who Have Served,” Fox 6 Now, November 5, 2016, last accessed September 28, 2017. ^ Katie Delong, “‘A Very Important Day’: Many Celebrate Labor Day at Laborfest, Milwaukee’s Labor Day Parade,” Fox6now, September 5, 2016, last accessed September 28, 2017. ^ Bret Lemoine, “South Shore Frolics Return after Financial Woes,” Fox 6 Now, July 13, 2013, last accessed September 28, 2017. ^ Jessie Bekker, “South Shore Frolics Divides Bay View,” Milwaukee Journal Sentinel, June 12, 2016, last accessed September 28, 2017; Ron Winkler, “Historic Bay View—Frolicking in Bay View,” Bayview Compass, March 1, 2013, last accessed September 28, 2017; Katherine Keller, “Crusade to Save Frolics Parade,” Bayview Compass, August 29, 2015, last accessed September 28, 2017; Katherine Keller, “It’s Official—Lions Cancel 2016 South Shore Frolics Parade,” Bayview Compass, April 21, 2016, last accessed September 28, 2017. Fox, Charles Philip, and F. Beverly Kelley. The Great Circus Street Parade in Pictures. Mineola, NY: Dover Publications Inc., 1990. Fox, Charles Philip. America’s Great Circus Parade: Its Roots, Its Revival, Its Revelry. Greendale, WI: Reiman Publishing, 1993. Geenen, Paul H. Schuster’s and Gimbels: Milwaukee’s Beloved Department Stores. Charleston, SC: Arcadia Publishing, 2012.